My session at SPTechCon was on SharePoint Web Services which rely heavily on CAML in SharePoint 2007 (less so in 2010 thanks to LINQ to SharePoint, but that’s another blog). So, it’s really important that you understand CAML or at least have a reference you can go to quickly.. so Pay Attention!!! 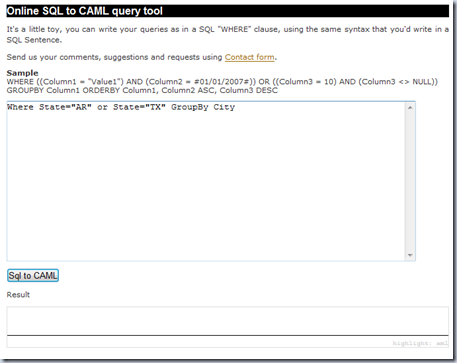 So, CAML is a special XML based query language used to well… query data from SharePoint. 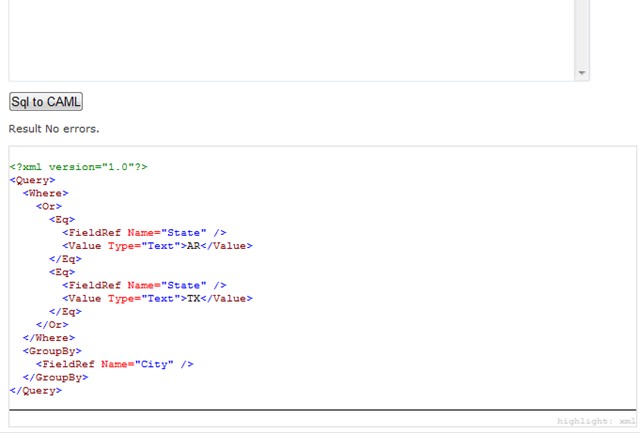 I describe it as a combination of XML, SQL, and WTF… At first glance it appears to be overly complicated and cumbersome. After spending time with it however you can get a sense for why it is structured the way it is..and don’t tell anyone I said this… but it actually makes sense! Is It That Cumbersome? Let Me See Some Examples?? WHERE (City="Harrison" OR City="Harrisburg") AND State<>"PA"
You get the idea. 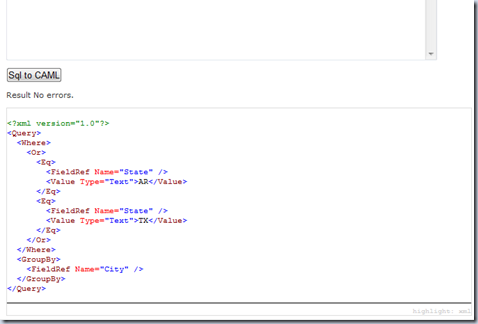 It’s not really THAT complicated, but if you are not comfortable with XML you will be MISERABLE! Are There Any Other Operators? I’m SO glad you asked… why… yes.. there are more operators! 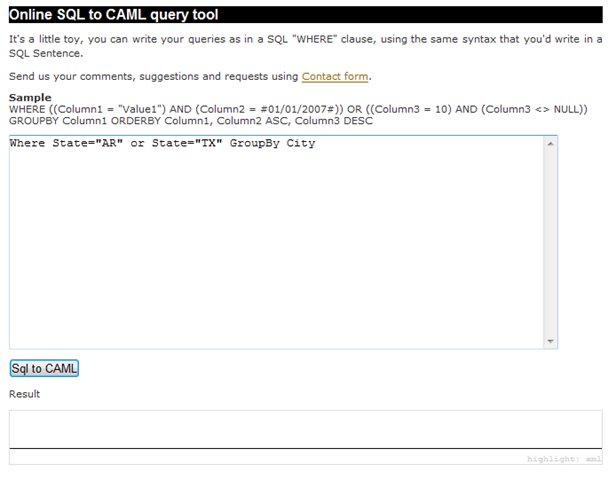 I obtained the following list from an article on A2Z.net called “CAML Query syntax and options in SharePoint”. This is actually a really great article and you should probably go read it after you are done here. Sort order for a query. There Has Got To Be A Better Way To Generate The CAML For Me! Wow… whine much? Yes, there are several tools out there that will generate CAML for you. Some you have to install on SharePoint and can actually work directly with a specific list. I’ve always been more of a do it yourselfer/notepad-works-for-everything type of guy. I found a great simple web site that will actually generate your CAML for you. So, you can type in “Where City=’Harrison’” and it will automatically generate the CAML for you. Pretty cool? 2. Copy and paste the resulting CAML where ever you need it! Definitely a handy tool. I’ve used it many times. The only flaw is that if there is an error in your Sql it will not tell you what the error was. Well.. that’s it for my Intro To CAML… Hope you learned something… Thanks again for stopping and thanks to all those who came to my session at SPTechCon! Nice Post. I'm trying to learn CAML. And this is one of the best "intros" I've seen so far. I especially like the translator tool. Yes - but what is missing? By simply pasting the above code - does a nicely formatted grid suddenly display on the page? Do you store the values returned? Exactly what do you do next with the code above? A faster way to build CAML Query. Hey Mark! What would <Aggregations Value="Off" /> do within CAML? The URL for Online converter is not valid. Can you please provide a working URL? The link that you have provided is not working..